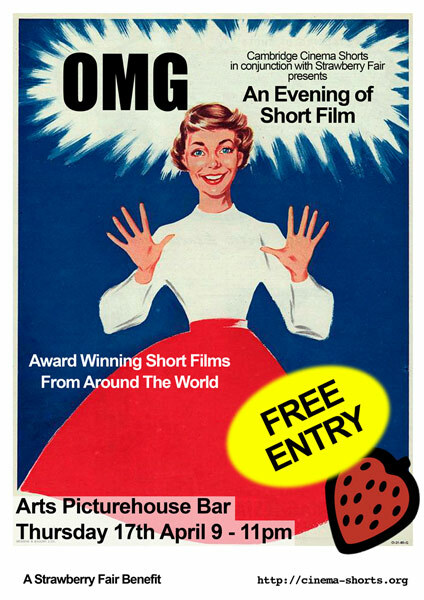 Cambridge Cinema Shorts in conjunction with Strawberry Fair and the Arts Picture House are delighted to present an evening of short films. This is a Strawberry Fair benefit event but entry is free and the only call on pockets, should the mood take you, will be for the café bar and a voluntary contribution when the hat is passed around during the evening. We have a superb selection of films to offer from our extensive archive and discussion and comment will be welcome. The event takes place on Thursday 17th April at the Arts Picture House, Cambridge in the café bar which is, of course, open all day but screening will begin at 9.00pm after audiences for the main films have left for their auditoriums. Once again, its free, there is a bar, its in aid of a great cause and its the start of a long weekend so no excuses…. Treat yourself.